5th grader Buster is no fan of math but he is a huge fan of baseball and has well over 600 baseball cards. It’s the start of baseball season and Buster has a few problems to deal with. First the team needs two more players to complete the Cougars team roaster, Buster’s failing math and the biggest of all, the Cougar’s league rivalry, the Pirates, are bullies that are showing their mean side off the field. 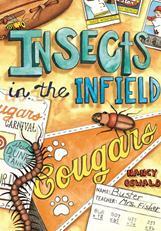 As an adult reader, Insects in the Infield is an inspiring read for younger readers. It’s a story that children can relate to being if they are failing in a school subject, dealing with a smart younger sibling, balancing sports and school learning and also handling bullies. Its an interesting story line with lovable characters and full of humor. Insects in the Infield is Animal Planet mets ESPN; the author gives educational scientific names for the insects and also she does a good job on the baseball game play descriptions. It is also a simple, laid back novel when children didn’t have much technology and they looked forward to outside play. I enjoyed the relationship between Buster and his younger sister Maggie. My favorite character Maggie is very smart and isn’t ashamed of it. Maggie has book smarts and is happy to help her brother with his math and it is so cute how she is so organized with teaching and is so happy to teach. She also makes the lessons interesting for Buster by showing him the relation between math and baseball. Also, I enjoyed how Buster’s friends also chipped in to help Buster pull his math grade up. This really is important and showed true friendship. It seems it took the parents quite awhile before they realized how badly Buster was doing in math, but when the teacher brought it to their attention the parents put rules into play. As with life there are bullies, and the author didn’t shy away from building tough bullies in this novel, but the fingerprints in blood on the notes were a bit much for me. Insects in the Infield is a book where insects have talent, and the neighborhood baseball team rivalry is a big community event. Pick up a copy of Insects in the Infield to find out if Buster is able to pull up his failing math grade and find out if the Cougar’s be able to win a victory against the Pirates.